I know, I know. Every single blog on the internet — not to mention every cookbook, magazine, and, you know, person — will tell you that they’ve got the best chocolate chip cookie recipe. I’ve made a lot of those recipes. I’ve subbed flours and tried different fats. I even made a fabulously complicated version that required a stopwatch. But in the end, I cannot leave this recipe, a minor modification on the Toll House classic. If you think of it, stick your butter on the counter the day before. If not, you’re going to have to wing it with the microwave — try using medium power or the defrost setting. I’m happy to tell you that as long as you don’t totally melt the butter, it seems to work out fine even if you go a little past the “softened” stage. Now would also be a good time to preheat your oven to 375 F.
Add the brown sugar to the butter in a big bowl and mix them, smooshing up the butter with the back of the spoon until they’re thoroughly blended. Add the vanilla and the eggs. The stirring will go a little more easily if you do the eggs one at a time. 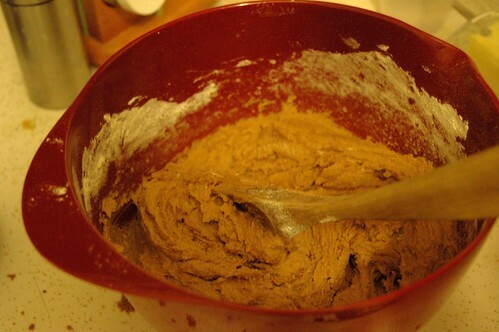 Add the baking soda, salt, and flour, and mix carefully until it turns into cookie dough. Mmm. You may now begin tasting. Scoop the cookies onto ungreased cookie sheets. You want the balls of dough to be about 1 1/2 inches across, with enough room to spread while cooking. Put them in the oven and set a timer. If you have two sheets in the oven, I strongly recommend setting it for four minutes and then rotating them; otherwise you can set it for eight. This is the secret: after eight minutes, turn your oven light on and watch obsessively. The cookies will be puffy, and then evenutally (probably around 9 or 10 minutes), they’ll drop and flatten out a bit. The minute they do this, whisk them out of the oven! 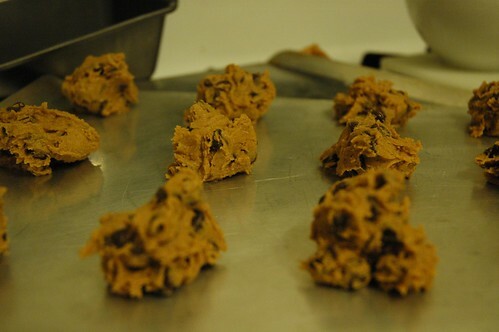 Overbaking is the mortal enemy of the perfect chocolate chip cookie. You might need to give them a minute to set up after taking them out of the oven, but move them to a cooling rack pretty quickly. Try to remember that if you eat them right now you will burn your tongue on the chocolate. *If what you have is salted butter, do not let it hold you back from your cookies. Just use a small pinch of salt later on. **I am utterly loyal to the fantastic vanilla from Penzeys. If you’re using a grocery store kind, you might want to let a little spill over the edge when you’re measuring. ***I use actual Nestle Toll House chips 95% of the time. If you want to use a different kind, I recommend ones that are roughly that shape — bigger chips or chunks change the cookie-to-chocolate ratio. i think it is wrong to call them the best chocolate chip cookies and not show a picture of the final product so we can judge whether or not they might fall into that category for us!